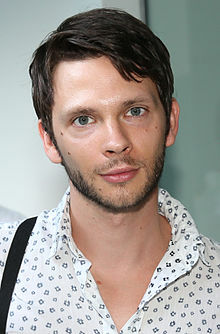 Devon Graye (born Devon Graye Fleming; March 8, 1987) is an American actor. He is mostly known for portraying teenage Dexter in the TV series Dexter, as well as the second Trickster in The Flash. Graye was born in Mountain View, California on March 8, 1987. He studied acting at the American Conservatory Theater in San Francisco. Although Graye is American, he lived in the United Kingdom for all four years of high school. Graye wrote a thriller screenplay titled Allison Adams, which was featured on the 2016 Black List for most popular unproduced screenplays. He has been dating actor Jordan Gavaris since September 2012. 2009 Saving Grace Luke Keeler Episode: Do You Believe in Second Chances? ^ "California Birth Index, 1905-1995". Ancestry.com. ^ Jung, E. Alex. "Jordan Gavaris On Why He Waited to Come Out". Vulture. Retrieved 2017-06-14. This page was last edited on 9 March 2019, at 20:37 (UTC).